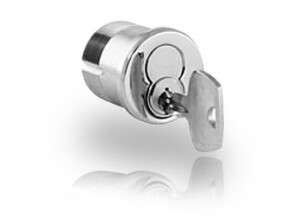 We received a call for locksmith service (specifically lock repair) the other day from a Facilities Maintenance company. I’ve worked with these companies in the past. Some of them are reputable and some of them are not. For this reason I’m always a little hesitant to take on jobs from FM companies. However, this time I relented for various reasons. Mainly because I was informed (by the FM) that this was an urgent issue and I happened to have a spare moment. I also enjoy working in the commercial sector. This job was for a commercial lock repair at one of the stores at the relatively new Outlet Mall in Livermore. When I got to the job site I realized that the problem with this lock started the day before. Also, apparently I wasn’t the only professional to work on this lock repair. The manager at the store informed me that when she tried to lock the door the night before, she couldn’t insert the key all the way into the key hole. She could not get the door to lock. After a brief examination of the area, I could see clearly that this lock cylinder (the part that the key goes into to actuate the lock) had been worked on recently. I questioned the store manager about this and was informed that she had called another locksmith the night before. However, he wasn’t able to repair this lock. The oil stains (WD 40? –BTW I don’t recommend using this on any cylinder) and pieces of broken pick tools on the floor left a gruesome (and messy) scene. He was probably very frustrated. I understand that he was there for quite a while and he probably did his very best to help them lock up the store; but his attempts were unsuccessful. I got to work right away on this lock repair. This was a mortise lock with a Sargent interchangeable core (IC core). I could tell that there seemed to be something stuck in the lock key hole which would explain why they couldn’t get the key inside the lock. I counted all the pins with my hook pick tool to make sure that the pins were all in good shape, active and going up and down the chambers freely, and not stuck in one of the chambers. The pins were fine; thus eliminating that as the possible cause. So my first assessment seemed accurate – there was something (an object) stuck inside the lock that needed to be removed. Knowing a thing or two about IC cores, I knew that I couldn’t push this object all the way to the other side since the plug of the core is totally blocked on the other side by the cam (the actuator that controls the lock mechanism). 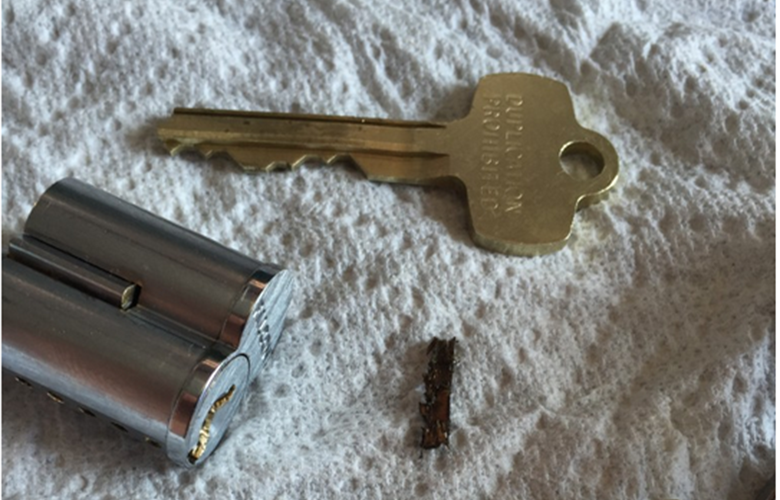 I removed the cylinder from the lock. Now I just needed to remove the IC core from its mortise housing. Unfortunately, in order to remove an IC core from the housing, I needed to use a control key. But the key wouldn’t go in….Hmmmmm… It appeared that I may have to use some effort, and force that key in. Of course, before doing this I had to ensure that I had the means to secure the store just in case the lock or key might be damaged in the process. I’m usually well prepared for these situations and this was no exception. Now I could really get to work. To get back to the lock repair… I took the control key and placed it inside the key hole (IC core) and tapped on it slowly. I helped the key make its way in the lock and around that object that was stuck inside. 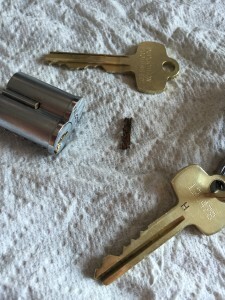 It worked just as I expected and I was able to remove the core from the housing; my first success for this lock repair project. With the core free from the housing I now have access to the entire plug and I can see every part of it. I could clearly see a piece of something stuck in there. I pushed it out. Turns out it was a piece of chipped wood. Quite a large piece of wood taken out of this IC core. The wood is in the middle of the picture. Now that piece of wood definitely didn’t belong there. I can only speculate as to how it got there. Once I removed the piece of wood, the lock was functioning just fine. I reinstalled the IC core in the housing, then installed the mortise cylinder, lubed the lock (with silicone spray) and tested it. It worked perfectly; problem solved. This commercial lock repair job turned out to be a relatively easy yet still gratifying project for me. It always feels good to solve problems and the store manager was very happy to have the lock working again. I enjoy working with commercial hardware and IC cores. I also always enjoy challenges, even the little ones. I don’t know how the piece of wood got into the lock but I wonder… I’ve seen pieces of other things stuck inside cores before. But this piece of wood didn’t seem to come from something else (e.g. pencil); and it wasn’t what I would consider normal dust or debris. Was the piece intentionally inserted to damage the lock? Was this the result of a kid who got tired of waiting for his mom while she was shopping? Or was it the act of an upset customer or employee? I just don’t know. But I did suggest that it might be time to install a camera or two.